I admit it, yes it was the sign out the front of The Sensory stating that it was agent for Anvers Chocolate that drew me into this shop to begin with, however upon entering I found there was so much more to experience inside. Tasmania is a beautiful part of Australia that is largely untouched by big business and pollution. There are some distinctive smells of nature that many tourists may wish they could bottle for ever. Well some smart scientists have done just that and created a unique aromatic experience for visitors. Unfortunately they have not created bottles of scent for tourists to take away yet but they have created three sensory domes in store to allow visitors minds to be transported aromatically back to relive a bit of the wild. The sensory domes are clear plastic domes in which visitors can put their head and allow unique southwest Tasmanian aromas such as Tasmanian devil, Tasmanian rainforests and Leatherwood flowers, to gently permeate their nostrils. The Sensory is also prides itself on being a retailer that promotes locally made products. They are a southern outlet for Bridestowe Lavender which means you have the opportunity to pick up some amazing Lavender gifts such as Lavender soaps and oils and even florally cards. They also have an eclectic range of handmade jewellery and locally knitted jumpers. If good quality tasty food is your thing there is an amazing range of locally produced honey for you to try, each with its own unique taste. The flavours are richer and more intense than anything you can buy in the supermarket. Some had a very strong floral taste, some almost caramel while others had a rich and creamy finish. Then of course there is the chocolate. 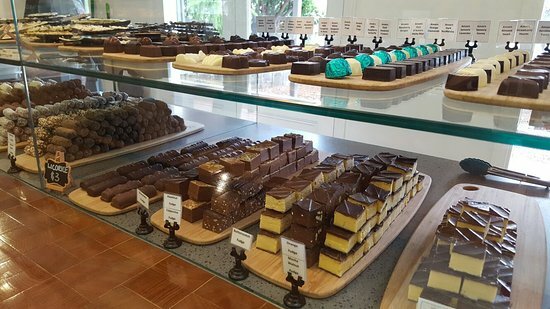 The chocolate is all handmade from the finest ingredients, they are so confident that you will love them they offer free chocolate for tasting. As predicted I did not leave empty handed, we bought a selection of handmade chocolates from the case mostly fruity ones and a few chilli ones. We also bought a bag of what they called ‘bark’ which are sheets of chocolate with various toppings. I can definitely recommend these. The Sensory is truly a feast for your senses I highly recommend a visit when you are in Richmond Tasmania.